Walmart Stores Inc. the worlds biggest retailer is in negotiations with Flipkart, leading e-commerce marketplace to buy more than 30 percent stake in the company in order to open another global front in its battle against Amazon. However, Walmart is likely to get only 20 percent of the company’s share due to objections of other company investors. The above investment negotiations by Walmart also include a proposal to open a chain of retail stores in India. In competition with Amazon’s presence in the retail market with its takeover of Whole Foods Market for $13.4 Billion, Flipkart has been trying to enter into the foray of offline stores for a very long time and has been looking for the right partner, and this opportunity has been presented to Flipkart by Walmart. It is not possible for Walmart to directly open retail stores in India because of restrictions on overseas investments in multi-brand retail and thus running wholesale operations instead. Flipkart, on the other hand, needs more than just capital muscle to take on the heavily funded Amazon in India. The Economic Times reported that the Flipkart is in talks to buy retail chain Vishal Mega Mart from TPG and Shriram Group. According to industry experts, a partnership between Flipkart and Walmart would boost the online retail business of Walmart and grocery and consumer goods business for Flipkart. 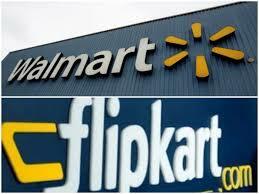 If the negotiations between the two company’s materialize purchases of grocery and consumer goods on Flipkart could be handled also via Walmart’s wholesale stores, improving product availability and delivery speed for Flipkart and a retail store partnership would allow Flipkart’s customers to order online and pick up their purchases from the Walmart stores. Previous articleFAQs : Why do you need to “buy” a smart speaker !